The SlingBag is a medium size bag that holds approximately 45 vinyl records. It has a pocket on each side and one full size pocket in the front which contains two free UDG CD wallets 24. 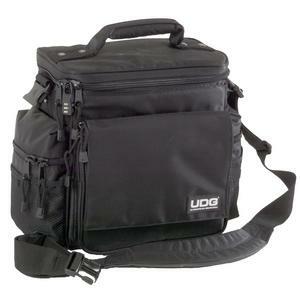 The UDG Slingbag comes with the original UDG Safe-T Lock which will safe guard your valuable records. It has a three number locking system that is simple to program. Next to this the bag features the special steel bolts which make it impossible for grips and straps to break loose from the bag. The SlingBag can be used as a set in combination with the UDG SlingBag Trolley. A perfect size bag for a quick DJ set!